It's reveal day over at Citrus Twist Kits today and we have lots to share including a line-up of colorful August scrapbooking kits and add-ons. We have a new look and style coming to our Pocket Life kit beginning with the September kit with lower shipping costs for our PL-only subscribers beginning with September. As the first kit club in the world to bring a PL kit to market in 2012 we weren't sure how scrapbookers would receive a PL kit. Since then the PL market has grown big and we've been listening to what our subscribers have to say. You asked us to get creative with ways to lower your shipping costs on our Pocket Life kits. We have some great news beginning with our September PL kits. We did it! We've downsized the box that your PL kits ship in. This helped us arrive at a lower shipping cost. Many of our customers have gotten back to us to let us know they have trouble using up an entire paper pad, so we'll be putting in a half pad (ranging from about 12-18 sheets of 6x6 paper) each month. This lowered the weight of the kit which in turn helped us lower your shipping costs. We are increasing the number of embellishments you get in your PL kits. The August kit is our transition kit. It still has the entire 6x6 (Shimelle!) paper pad plus a little extra embellishment. Beginning in September the cost of the PL kit will increase to $19.50. By adding more embellishments we've increased the value of your kit. The good news here is that for current PL subscribers or new subscribers who subscribe between now and August 31st, you will keep the current price of $18.00 as long as you continue your subscription. Here is a sneak peek of our new Pocket Life kit (September 2014). 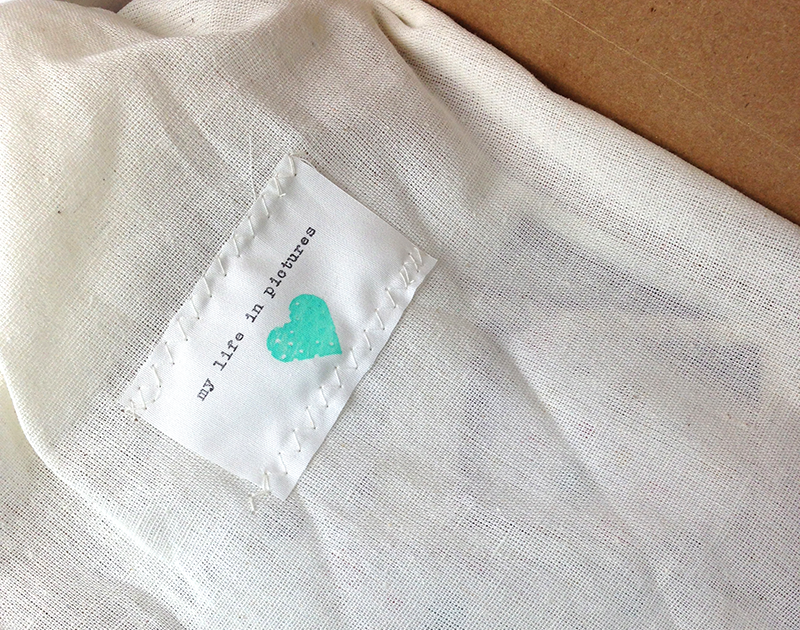 Each kit will come sweetly packaged in a cute little cloth bag with a special treatment applied. Main Kit. We'll start off sharing the Main kit "All that Glitters." We love that the new lines are arriving and are joy-filled to finally share some of Shimelle's new line in our August kits along with other new lines that have just hit the market! We are seeing design samples come in from our design girls that are soft and/or bold. You can take this kit so many different directions! You can check the kit out here on our Kits page. Pocket Life Kit. "It had to be You" is August's Pocket Life kit and it features color, color and more color! 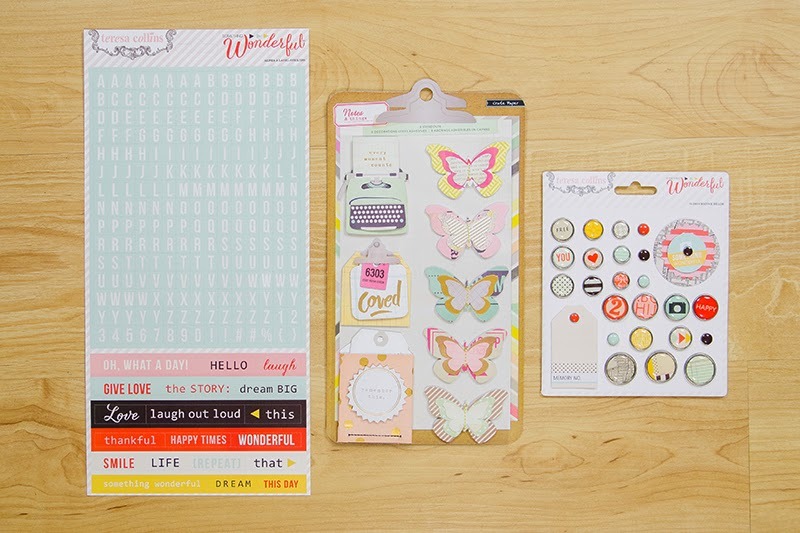 Our "It had to be You" Pocket Life kit is packed with color, fun and embellishments this month. Be sure to visit our blog in August to see what our PL Design Team has been up to. Add-on Kit. "Seaside Adventure" is our Add-on kit this month. 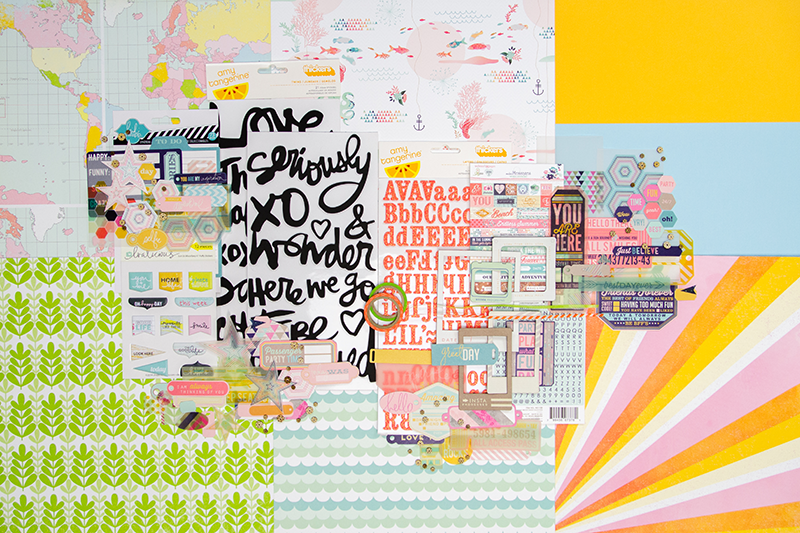 You are in for some fun with this month's colorful collection of whimsy and joy! Mix and match new papers from Studio Calico Brighton Pier and Webster's Pages Ocean Melody, throw in Heidi Swapp Hello Today ephemera, 2 alphabets (one adorable mini, one sparkly orange foam), big Amy Tangerine foam words, frames, puffy shapes and darling wood sequins and you will have a scrapbook party of your own! August Stamp. Our "Weather Report" August stamp is available by subscription for $4.25 includes shipping worldwide ($3.25 for our Main or PL kit subscribers.) You can also get this 19-piece stamp set individually for $5.00. Embellishment Kit. 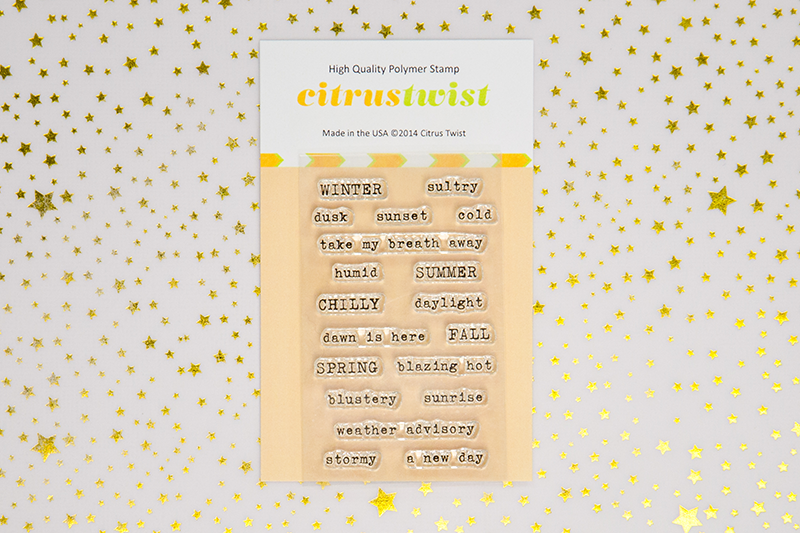 The "Summer Dreaming" Embellishment kit is packed with cuteness to grace your scrapbooking or PL pages. We've combines a soft aqua mini alphabet sticker and word set with layered standouts and colorful brads. PL Embellishment Kit. Our "Little Bit of Sass" PL Embellishment kit is (while this kit sold out during presale, we are hoping to receive more soon) just packed! 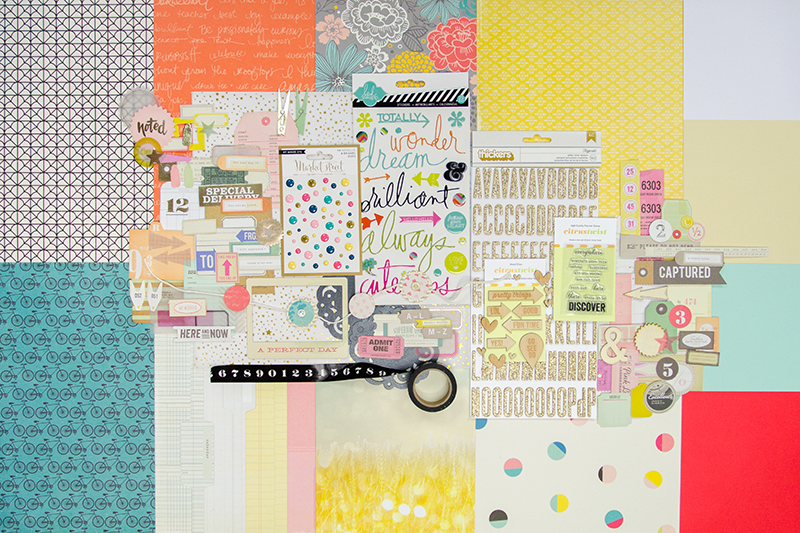 If you like Shimelle, ephemera and a little chipboard and buttons, this kit is perfect. Pattern Paper Kit. 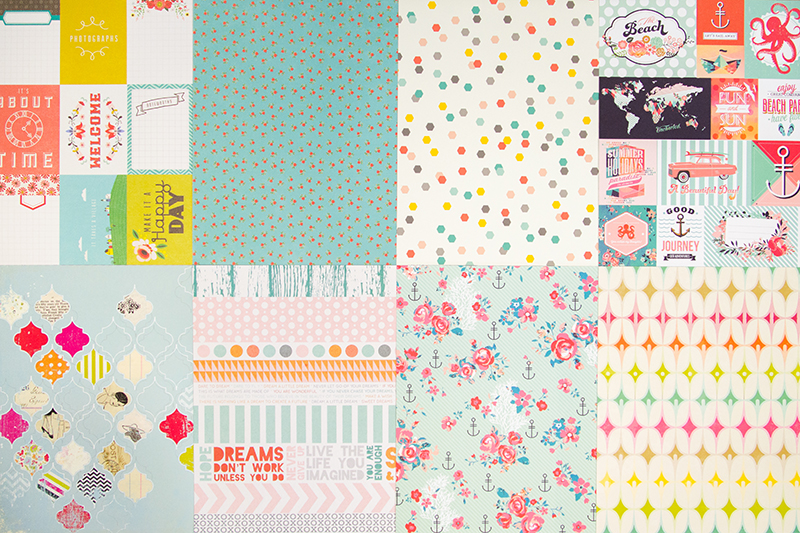 It's "Time to Play" with this month's Pattern Paper kit. We've pulled together lots of pattern and bright colors for you this month in this 12 x 12 paper kit that matches both the Main and Pocket Life kits. Here is our video reveal for August for those of you who want to see all the details of our kits. 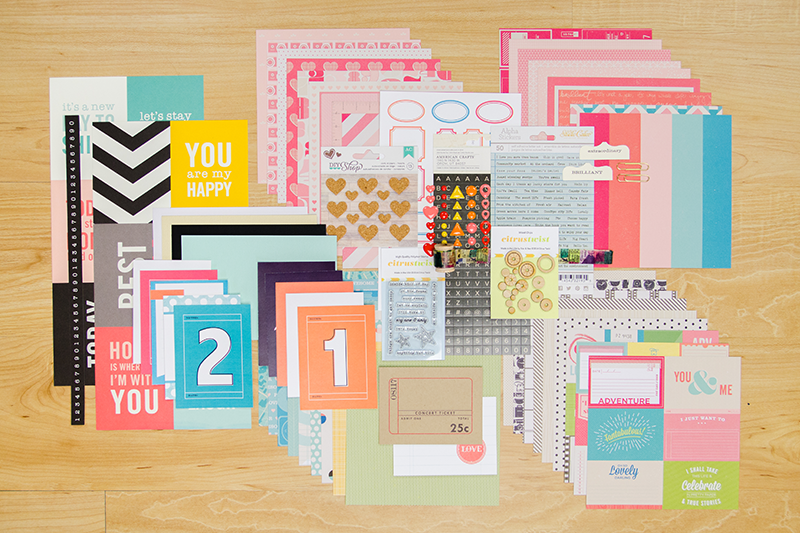 Have fun scrapbooking and Pocket Life'ing this month. Thank you for popping by to read our August kit reveal blog. The kits are beautiful and I can't wait to see the new store interface!